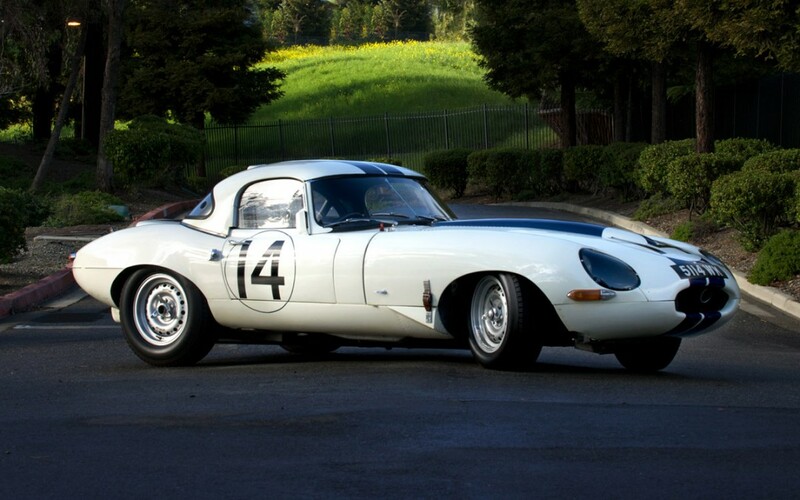 Briggs Cunningham imported three Jaguar E-Types to the United States in 1961, with the intention of racing them in the 1962 season. They were earmarked for himself, John Fitch, and Walt Hansgen. Cunningham replaced the steel body with custom aluminum bonnet, boot, and hardtop, and added competition wire wheels, brakes from a Mark IX, along with other refinements. The No. 14 car, wearing UK licence plate 5114 WK, soon scored a 4th in class at Bridgehampton in 1962. With Sebring out of the way, the trio of modified E-Types were off to the 1963 running of the Le Mans 24 Hours where the No. 15 sister car finished 2nd in class. (Sadly, our No. 14 suffered gearbox failure very early on and ended up being a parts donor to No. 15 after an incident on the track.) A few more races in 1963 was all that this gorgeous Jaguar/Cunningham E-Type was asked to contest for the Cunningham team. Today, adorned in the famous American racing colors – white with blue stripes – just as it raced when new, and still bearing a few minor dents, it resides in the Blackhawk Museum in Danville, CA. With thick leather belts securing the bonnet and enlarged engine bulge, she looks the business and evokes memories of the glory days of racing.